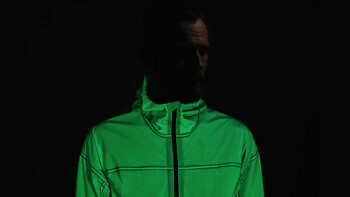 The Solar Charged Jacket that glows like kryptonite. Named as one of TIME magazine's Best Inventions of 2018 and as Sports Gear of the Year by WIRED, the Solar Charged Jacket is made from a highly responsive material that can be instantly charged and made to glow in the dark by any light source you can find. Whether you’re writing on it with your iPhone torch, drawing on it with a flashlight, charging it up underneath a lightbulb, or wearing it out in the sunshine, as soon as you take it somewhere dark it glows like kryptonite. And while this is the kind of tech that would normally only work in a lab, the Solar Charged Jacket performs amazingly out in the real world. With every detail laser cut and welded, it’s waterproof, stretchy, highly breathable, and so soft and lightweight you can roll it up into your hand. The Solar Charged Jacket is currently sold out but you can sign up for advance access to the next edition, which will be available in 2019. Sign up to get advance access to the next edition of the Solar Charged Jacket and other new releases. 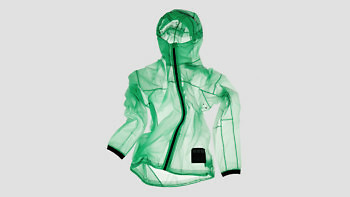 The core tech that enables the jacket to glow is its membrane – an ultra-thin layer housed inside a translucent mesh that keeps rain out and lets sweat escape. Engineered with a phosphorescent compound it rapidly stores any light it comes into contact with and re-emits it slowly over time. The membrane acts as if it’s alive, absorbing sunlight like a plant. And with the phosphorescence engineered into the membrane itself, the tech sits at the very centre of the fabric, so it can’t wash out or rub off. 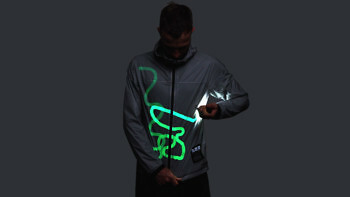 To see just how responsive the jacket is to light, the simplest thing to do is go into a dark room and start writing on it using the torch on your phone against the surface of the fabric as if you were using a pen on paper. It will start glowing instantly and leave a trail of light. There is no time lag or warming up. The fabric reacts the moment light strikes it. 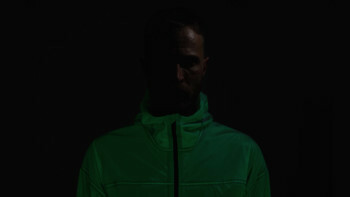 The fabric reacts so rapidly you can see the jacket’s tech at work anywhere, but the darker the room you’re in or the mountain you’re on, the brighter the glow will appear. Drawing on it with a flashlight or headtorch is one of the more fun things you can do. And we made it with lasers and welding so that every part of the jacket apart from the zip behaves like a light or a canvas. The Solar Charged Jacket is naturally fuelled fast by sunlight, so one of the easiest ways to charge it is by wearing it outside during the day. Whether it’s for 2 minutes or 2 hours, the jacket will store the energy from the sun and start glowing as soon as you head somewhere dark. Even if it’s a cloudy day or you leave it near a window, daylight is bright enough to charge it up. When it’s fully charged at night it glows green like kryptonite. As well as being a cool party trick, it can be life-saving on a mountain. No search team would ever fly past a human-sized firefly. This image was taken after blasting the jacket with multiple high speed 12,000 watt flashes in a studio. But you’ll want to run your own tests on it – we know it looks particularly amazing in body scanners at airports. The logic behind the jacket is really simple: the brighter the source you charge it with, and the longer you charge it, the more energy it will absorb and the longer and brighter it will glow. 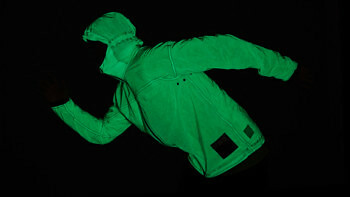 The jacket will always appear to hold its charge longest out in nature at night where there’s less light pollution. As the jacket fades back to grey over the next few hours or minutes, depending on its charge, it will go through several phases, from a radioactive looking green, to a silvery green, then finally a ghostly white. The glow is at its brightest immediately after it has been charged, but can remain for up to 12 hours. At this point the jacket will be left with a ghostly glow that you’ll only see in your peripheral vision or if you stuff it inside a dark bag. If you want it to glow brighter at any point you can recharge it. If you’re heading out for a run you can use anything to hand to top it up – a head torch, your car headlights on full beam, even standing near a 60 watt bulb will do it. 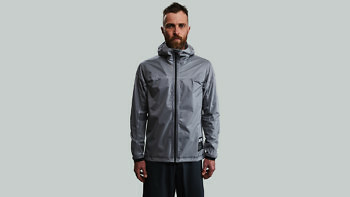 In broad daylight the jacket will only ever be a subtle light grey. And it will stay that colour until you go somewhere dark. In very bright light conditions the fabric will look semi-translucent, so if you’re wearing a black t shirt underneath it, the jacket will look darker than if you’re wearing something white. Built with precise engineering and no extraneous details, when you’re not taking it running through the night, the jacket is smart enough to work as your office jacket. Even if you took away this jacket’s ability to store sunlight, you’d still be left with one of the most technologically advanced jackets ever made. That’s because the light-responsive material is also insanely high performance out in nature. It stretches more like a baselayer, keeps you dry, is highly breathable, protects you from headwinds, is so light you can roll it up in your hand, and just happens to be storing and emitting light at the same time. Every square centimetre of the material stretches which makes it perfect for sport. 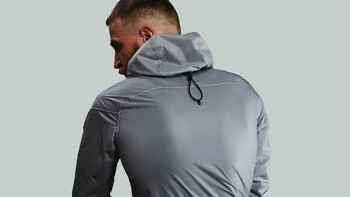 The fastest way to see how much the jacket stretches is to pull it tight over your back – the elasticity is closer to a baselayer than a traditional shell. We’ve also engineered the jacket for movement. The sleeves naturally take the shape of someone running, with an articulated bend and extra underarm panelling. So whether you’re climbing, running or riding, the jacket will never restrict you. 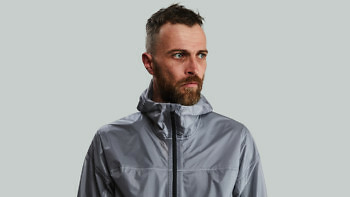 The jacket is waterproofed against ocean spray or summer showers, with the same membrane that stores and emits light also there to keep you dry. We finished every seam on the jacket with a specially designed transparent tape so that none of the glow is lost – and the whole surface of the jacket emits light. 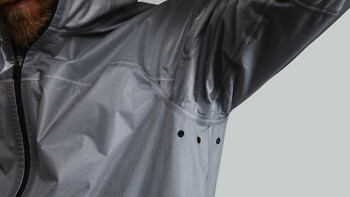 The waterproof front zip with a concealed storm guard gives you extra protection. The jacket is so soft you can comfortably wear it with just a vest or super light baselayer underneath and it won’t cling or stick to your skin like some lightweight jackets do. Whether it’s on your back or in your bag, it’s light enough to feel like it’s barely there. It’s also thin enough to roll up in your hand. So if you want to take it off and you look like you’re holding something that’s just crash landed from another planet, you can. 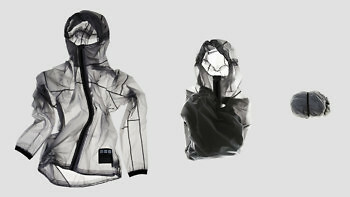 The Solar Charged Jacket is the Swiss army knife of jackets. At 230g it’s ultra-light and packable. So even if it’s been stuffed in your bag all day, it takes very little space or weight and the tech can’t fail. You can use it day or night for any type of sport or adventure to light you up and keep you safe and dry. 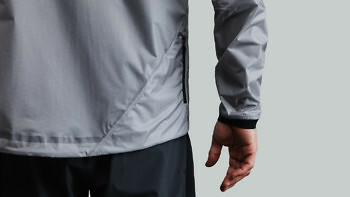 Whether you’re heading out training in the dark, running an ultra through the mountains, climbing, riding, or out on the water, it works as a phenomenal lightweight rain jacket, windbreaker, emergency layer or safety device. The entire jacket is constructed with a minimalist approach to design and precise engineering, which means it’s both smart enough to wear to the office and high performance enough to wear when you’re off grid. The cuffs are laser cut and bonded. 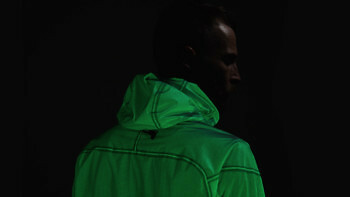 Every seam is taped to give the jacket an incredibly clean look where every square centimetre of the material glows. And with every seam taped, there isn’t a single stitch on the jacket that could possibly rub you. Designed to hold your phone, keys and card on land, or your GPS in the water, the pocket is built to operate in the simplest way possible. Your phone slides in diagonally to fill almost the whole pocket which means it won’t jump up and down when you’re running, and you can use the adjustments at the hem to lock it down even more. The pocket is fastened with a rubberised lockable zip, so once it’s done up it won’t come undone. While the entire jacket is made from the same highly breathable material, we’ve laser cut three air vents under each armpit to provide a little extra airflow when you’re working your hardest. All six vents have welded edges to keep the material intact. The hood and waistband are both fitted with elasticated drawcords that can be pulled tight at high speed. The hem cord is below your left hip and pulls the whole jacket tight below your waist for freezing nights. The drawcord on the hood runs around the centre of your head, and however tightly you pull it, the stretchiness of the fabric and cut of the hood mean that when you turn your head the hood turns with you. 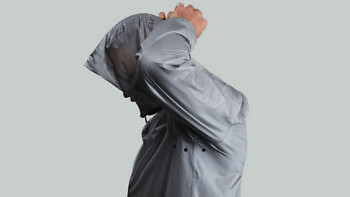 Vollebak's latest shell is the ideal companion for dark, wet winter runs. 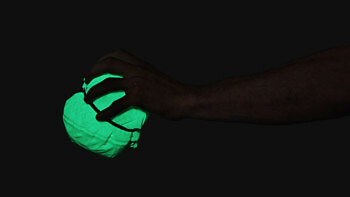 Innovative use of a phosphorescent mesh membrane enables the jacket to absorb light during the day and release energy when the Sun goes down, turning it glow-in-the-dark kryptonite green. The reason the jacket is so striking is just as much about the fine finishing details as it is any technological innovation. The glow stretches evenly end-to-end, everywhere but the zippers and pull strings, to include even the seams themselves. It's fully seam-sealed and waterproofed, so it handles summer showers with ease, and its mind-bending material also stretches and compresses down, so it won't take up a ton of room in your bag or pack. Vollebak, the kings of way-too-technically-advanced gear, have done it again. They’ve made something you never in a million years thought you would need, but now have to have. Introducing the Solar Charged Jacket. 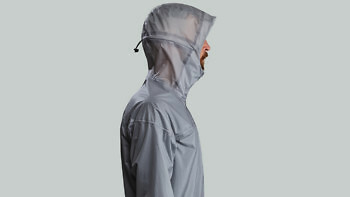 Gear manufacturer Vollebak adds to its cache of outside-the-box product design with a technical jacket that stores light and re-emits it at night. Yep, this jacket glows in the dark.